This information is provided "as is" without warranty or any kind, either expressed or implied, including, but not limited to, the implied warranties of merchantability, fitness for a particular purpose, or non-infringement. In no event shall RehabEngineer.Homestead.com or Michael Papp be liable for any direct, indirect, incidental, punitive, or consequential damages of any kind whatsoever with respect to the service, the materials and the products referenced in these documents. This applies to all pages on this web site. I was asked to work with a consumer with severe Cerebral Palsy who was going to be hired to enter contact information from sheets of photocopies checks into a database using her communication device. Each page would have 4 or 5 checks on it. She is non-verbal, drives her wheelchair with a sip-n-puff system, accesses her aug comm. device with a head tracking system, and the only consistent switch site is her left wrist. She was using a Pathfinder, which was easily interfaced to the computer as an input device with a PRC IR box. Her employer also wanted to be able to give her several pages of data to enter. They had asked about using an automatic page turner. I have lots of experience fixing page turners I didn't recommend, and I prefer to stay away from them. Instead, we decided it would be cheaper and easier to maintain a document holding carrousel that could be loaded with several pages, and that she could turn with a switch. After doing some quick calculations, it was decided that a reasonably sized carrousel could hold 6 documents. The switch activated document carrousel consists of a small battery powered turn table with an 8 pound capacity mounted on an octagonal pedestal assembled from 2x4 stock. Both the base and the top of the carrousel are made of 3/4" Lauan plywood, cut octagonally. Each side of the top has a clip board hanging from it, for a total of six clip boards. 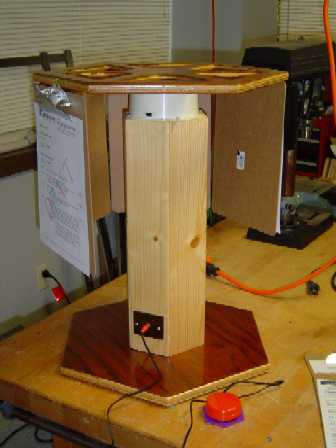 The battery powered motor has been adapted with a switch jack mounted at the base of the pedestal. Any switch with a 1/8" plug should operate the carrousel. The carrousel rotates as long as the switch is being pressed. Alternatively, there is an over ride toggle switch on the side of the motor housing. When the over ride switch is flipped, the carrousel will rotate continuously. The device is just over 22" tall, and requires at least a 19" diameter to rotate. Total costs to make the first one, excluding the switch, was $108.95. Because all the templates and jigs have been made, I estimate the cost of building more switch activated carrousels would be about $69 each, sans labor and other listed items not included in the original cost. Another feature that could be included that would increase cost and assembly time would be a self indexing and latching circuit, which would allow a use to hit the switch one and the carousel would automatically move the next clip board into the proper position.